I rarely wear loose eyeshadow, because I'm scared of the mess, but recently I've been venturing more into the arena with some colours that are pretty complex. 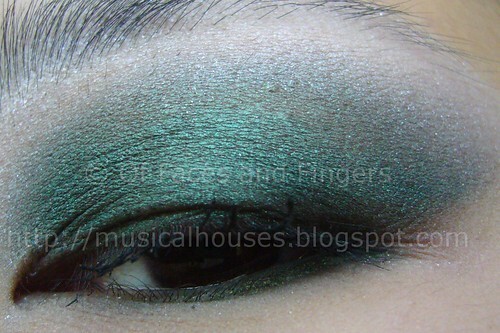 Evil Shades, one of my perennial favourites for loose eyeshadows, has again captivated my heart, this time with another beautifully complex eyeshadow from their Mythology Collection, Dryad. That's a lot of product, given that it's all in a small container. These things can be massively pigmented, so a little bit will go a long way. 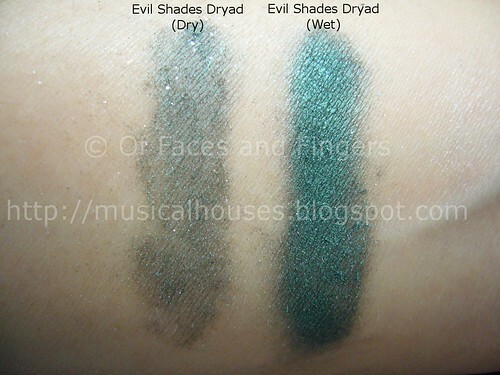 Here are dry and wet swatches. Dry, you get a blackened green, which is pretty to have, but perhaps not very stunning. However, once you foil it a little, you get a gorgeously stunning metallic forest green. Don't you just love how it morph into something that's just pretty, to something so eye-popping? It's like the colour really comes to life when it's foiled. And here's the eye closed. I liked this shadow, once foiled, it went on very well, and didn't give as much fallout as I thought. And here's my eye in a really weird half-open, half-closed position. I was trying to get the picture at an angle where you could see the metallic finish of the eyeshadow, but obviously I failed, because the camera didn't pick up the subtlety of Dryad. 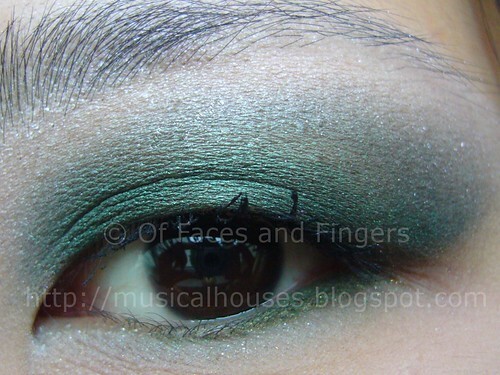 I don't normally wear such dark shades on my eyes, but I really enjoyed wearing this one! It's green, but it isn't your usual Springy-bright-happy green. 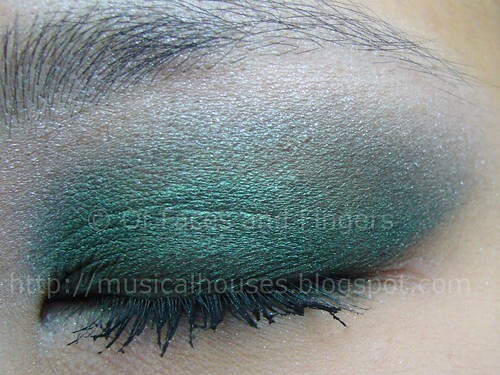 Instead, this one is a Spring with a smokey twist - a sparkly, metallic, foil-like forest green. I do kinda feel like a forest nymph wearing this one! Huh, I've never heard of Evil Shades but I guess I'm going to have to check it out! That looks AMAZING wet! I would be interested to see your entire face with this makeup, I want to know what blusher and lipstick you've chosen any chance of Twitpic? I love your blog! Check out mine! Oh, how amazing this looks. LOVE! Gorgeous! :) I love green. I love this look- it is too pretty! About loose eyeshadows- at first I was pretty intimidated by them, but a great product to use to get the intensity and evenness of foiling with out having to foil is Pixie Epoxy from Fyrinnae. It is WOW. I hate to say it, but while the shadow looks great, you've got tarantulashes going on.